III the date he or she joins the club, and on the same date each recurring year. The amount due the State Association shall be for-warded to the State treasurer, by superinten-dent the first of each year, in September. Article V. The affairs shall be elected annually and shall report to the society whenever required. 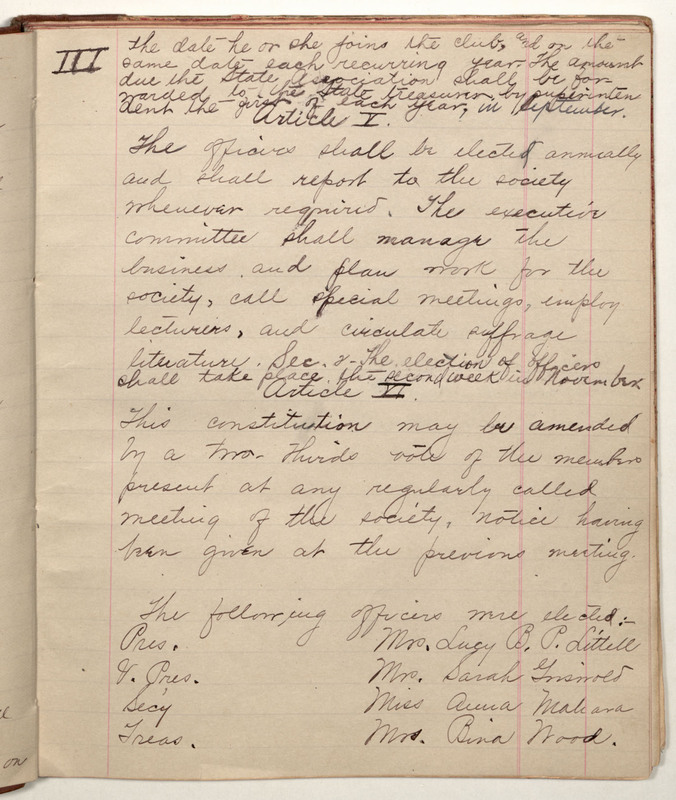 The executive committee shall manage the business and plan work for the society, call special meetings, employ lecturers, and circulate suffrage literature. Sec. 2. The election of officers shall take place the second week in November. Article VI. This constitution may be amended by a two-thirds vote of the members present at any regularly called meeting of the society, notice having been given at the previous meeting. The following officers were elected: Pres. Mrs. Lucy B. P. Littell V. Pres. Mrs. Sarah Griswold Sec'y Miss Anna Mahara Treas. Mrs. Bina Wood.